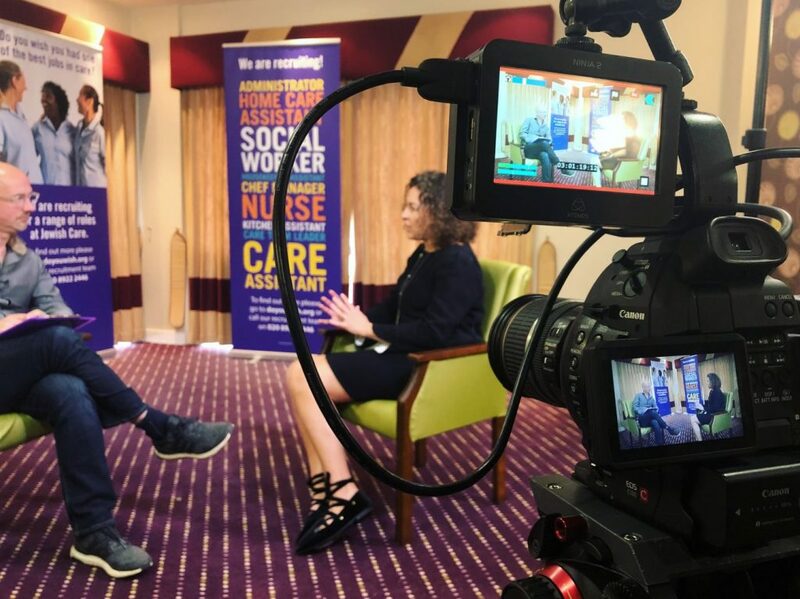 In 2018 we were commissioned by Neil Eastwood of Sticky People to handle the video production for his video-based training course, Neil Eastwood’s Care Recruitment Masterclass. In addition to 90 modules filmed in front of our studio green screen, we travelled to London to film a series of short interviews with people in industry. These served as case studies for Neil’s recruitment methods and offered insights into how they were put into practice. The video above is an excerpt from an interview with Alex Myers of Jewish Care. The thing that makes these interviews unique is that we were able to create the multi-camera interview format with only a single camera. (An interview like this would typically be filmed with three cameras – one for each angle.) The reason we opted for the single camera approach was to keep costs down. Although we have wide range of cameras available to us, making multi-camera interviews no issue, the cost of transporting several cameras and crew to London would have been in excess of Neil’s budget. Yet, with clever filming and editing, we were able to achieve a very convincing result with a single camera and operator while keeping well within our Band A pricing bracket – and keeping our client very happy with the result! To find out how we did it, or to find out what producing a similar video would involve, get in touch with us or submit a brief.